Do Teens Still Get Enough Sleep? Life is what you make it. Sounds cliché but it can’t be any truer. You determine your own course in life. There may be stumbling blocks along the way but it is still up to you make the choices you want. Every little decision you make determines what your future will be like. For instance, you decide whether you maintain a normal sleep-wake cycle or not. Unfortunately, it is easier said than done these days. There are so many distractions that sticking to a fixed bedtime routine isn’t as easy as lying down on the bed and closing your eyes. From teens to younger adults, the tech and smart gadget obsession can’t be denied. Your every waking moment is probably glued to that tiny device that means so much in your life. However, it’s not nice once this obsession affects your health negatively. For a young teen trying to juggle school requirements, personal and home obligations and social life, it can be overwhelming at times and they end up losing sleep every single night, some even have snoring issues. Why do children wake up early when they are young but want to stay in bed till noon as teenagers? Experts say it’s biology. Adolescents’ bodies want to stay up late and sleep late, putting them out of sync with what their school schedules demand of them. 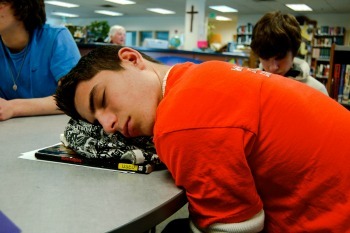 So kids have trouble waking up, and they often find themselves feeling drowsy in morning algebra class. But that chronic sleepiness can affect their health and well-being, their behavior, and even their safety; it becomes genuinely dangerous when sleepy teenagers get behind the wheel. At a recent conference on adolescent sleep, health and school start times, at which I gave a brief keynote, several experts made compelling arguments supporting the idea that middle and high school start times should shift to 8:30 a.m. or later, as recommended by the American Academy of Pediatrics and the American Academy of Sleep Medicine. Have you seen the social media accounts of teens these days? They are so updated on all the latest trends and their #FOMO drives them insane, so they often compromise their sleep to stay on top of everything. Add to that those school assignments that take up most of their time at home leave them with little time to sleep. The movement to start the school day later is gaining traction, and for good reason. Research shows that puberty shifts the circadian rhythm of children, contributing to later bedtimes and wake times. It also shows that teenagers need eight-and-a-half to nine-and-a-half hours of sleep a night, but only one in three are getting at least eight. It’s why nearly 200 education and health leaders are meeting at the first-ever National Conference on Adolescent Sleep, Health and School Start Times Thursday and Friday in Washington, D.C.
Their goal: Encourage school districts to start the class day no earlier than 8:30 a.m. for middle and high school students in order to accommodate their changing body clocks and improve their chances for quality sleep. Mood changes and decision making is affected by sleep deprivation. And considering how many changes are happening to a growing teen’s body, these various external factors can be too much for an immature teen to take. They won’t be able to make the most sensible of choices and often compromise the more important things in life in their quest to fit in this world, especially with their peers. It is really unfortunate that sleep is the first to go in a teen’s agenda when they are pressed for time. After all, we often make ourselves believe that we can always catch up on lost sleep but that is not entirely true. Then, there is the growing issue on various sleep-related disorders that make sleeping impossible for some. While they continue to make sleeping the bane of some people’s existence, there are solutions now sold in the market. Some of them are your typical anti-snoring gadgets and mouthpieces that help correct an anatomical defect to reduce the snoring and hopefully improve the condition. Teens are vulnerable to these conditions too, so they should also see a medical doctor if their case warrants it.